So far this March, two nor’easters have pummeled New York and New England with high winds, storm surges and heavy, wet spring snow. As if on cue, large trees fell. As they did, their fractured branches and trunks severed electric power lines. And for a hopefully brief period darkness reigned. Thousands of electric utility customers have shivered in the dark for several days at least. Worst storm since Superstorm Sandy, said some utility executives. Good to know. And with the same results. From a customer’s standpoint, nothing much has changed. Does it have to be this way? The county executive of Westchester County, George Latimer, viewing the slow pace of power recovery, declared that the presidents of Con Edison and N.Y. State Electric and Gas should resign. The local cable news station featured complaints by consumers about faulty, uninformed inadequate and possibly mendacious advice from the utility on time of service restoration. The governor, who lives in the county, had a few words to say but did not appear on the scene. The president of Con Edison appeared on television in Con Edison’s war room, informally attired. He said the utility not only had to repair but also rebuild its network. Presumably preparing it for the next tree that falls. The utility’s franchise exempts it from liability due to “conditions beyond the company’s control, such as storms… as long as reasonable efforts are made to restore service…” Sounds reasonable, but that exemption also creates a perverse economic incentive to not take preventive steps because the cost of failure falls on the customer not the company. Not to imply that the policy makers meant that nor that a utility’s management would deliberately ignore preventative measures, just that the exemption as written send the wrong signals. In the dark customers need the right signals. Related: Glut Or Deficit: Where Are Oil Markets Headed? Trees and power lines have the same traditional relationship as assassins and their victims. Motive is irrelevant. Only opportunity. And boy did the trees get an opportunity to do some dirty work this time. Given the routine but sometimes disastrous nature of the long term relationship between trees and power lines, more storm preparation seems necessary. This would be at the local utility distribution level, where the bulk of outages take place. To make the point clearer, the industry has had many outages and the number does not seem to be declining. Whatever it has been doing to add intelligence to the network has not changed the picture. 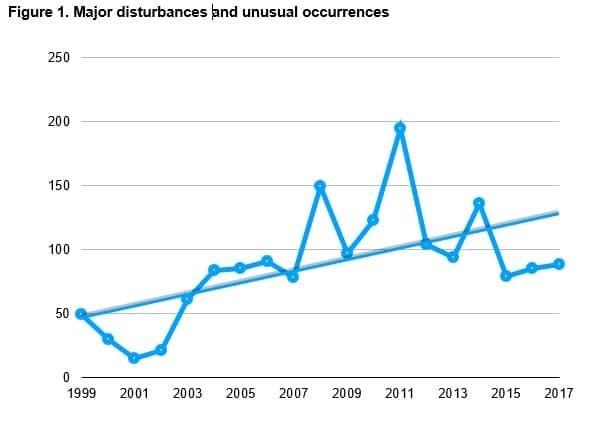 As figure 1 shows, the number of “disturbances” varies from year to year, but the trend line is upward sloping. But what should policy makers do? There are available solutions, like burying power lines underground, that ensures extremely high levels of electric reliability. It's just very expensive. A less expensive, but still costly remedy (which occasionally stirs up public opposition) is more aggressive tree trimming around power lines. Policy makers and our elected officials do not have the information or expertise necessary to decide on rules to ensure more reliable electrical service. The local utility, facing new politically imposed rules, will follow them regardless of the actual impact on customer service. 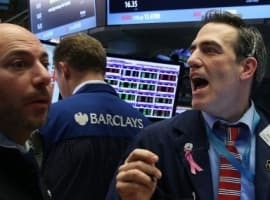 This insulates them from regulatory opprobrium. “We did what we were told”, they will say. Recent political winds favor deregulation and dismemberment of the vertically integrated utility. The traditional public service ethos (you may recall the number of utilities and regulatory agencies with “public service” in their names) has been replaced by a more "modern", simple profit maximizing approach to business. We do not judge. But this influences how utility managers approach their tasks. And ultimately how customers view their utility. Is customer loyalty still important? This reminds us of a consultants’ report (one of the authors participated in the study) years ago. A large electric utility company, believed responsible for an egregious service interruption, had hired the consultants. They suggested at the time that electric service reliability was actually an insurance issue. They proposed that the local utility guarantee its customers a certain level of service and bill for the equivalent of an insurance premium. If the utility failed to meet prescribed levels of customer service it would have to make a specified insurance payment to customers (with a deductible). The utility could use the premium to improve its reliability and customers could feel that they are paying for protection. The CEO of the utility in question did not like the idea. An insurance scheme seems more likely to produce the desired results in today’s utility world than specific regulation. It addresses the problem of information asymmetry. Regulators and lawmakers know far less than the utility managements about the real costs of measures proposed. Whatever the utilities are doing now, seems to produce the same results storm after storm. That calls for a new approach. Canadian retirement funds bought my local utility. They trimmed the trees near the lines, and changed poles, cross arms, and even some transformers on the feeder line routes. Canadians know what they are doing with electricity. Oh, and they gave us free electricity for a couple of months as part of the purchase, while agreeing to freeze rates for years. Good luck beating that deal. Electric utilities routinely ignore the potential for lengthy outages because they would have to take meaningful -- and expensive -- steps to prevent them. Instead, in most cases, they're willing to destroy neighborhood looks and values by "trimming" trees into bushes and if they die, well too bad. Don't know about other states, but it appears cable providers have gotten into this scam as well, at least in the Midwest. Stately trees destroyed so cable can ride the power poles feet below the actual power lines is not greatly appreciated when the summer shade trees offer is even more compromised than before. Cut the trees down within so many feet of the power line or trim them. That’s what Entergy Louisiana does, especially when a hurricane is headed our way. The people who don’t want to do this are the ones to blame. Best solution is to just cut them down & plant trees away from the power lines. Burying lines is not the solution. Roots & people digging, as well as flooding sometimes affect the lines that are buried.